The Franklin Woman's Club is committed to providing community service through volunteer work and/or organizing donation opportunities with local, national or international impact. See below for a description of projects and ways you can get involved. In 2017, the Franklin Woman's Club made a donation to The Pennies for Puppies Program (The Seeing Eye, Morristown, NJ) which will allow Xelda to become a Seeing Eye Dog. Franklin Woman's Club members donated and packaged three beautiful baskets filled with favorite holiday foods + a $25 ShopRite gift certificate. 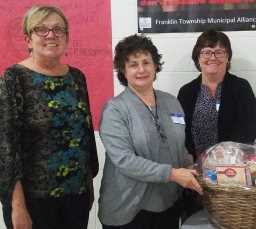 Baskets will be brought to the Community Resource Center (Franklin), whose staff will distribute them to help single-mom families in Franklin Township enjoy Thanksgiving. (Pictured left to right, Woman's Club Members: Phyllis Beals, Mary Lou Bak and Lisa Andreini). On Sunday, October 18th, Valerie Buckner, Lucie Foley, Karen Bauer and Mary Ann Vetter (Franklin Woman's Club members), met to fill 14 Christmas stockings with toys, puzzles, nuts, candy, gum, small games, stationery, toiletries and cards (donated by fellow club members). This special Franklin Woman's Club project was organized by Mary Ann Vetter. These stockings were sent to our troops overseas as part of a project known as Boatsie's Boxes. (Boatsies Boxes is a non profit charitable organization dedicated to supporting our troops by sending boxes of supplies (and Christmas stockings) to soldiers in Afghanistan, Iraq, UAE, Persian Gulf locations, Okinawa, Estonia, Kuwait, Africa and Korea. Visit: www.boatsie.com for more information. 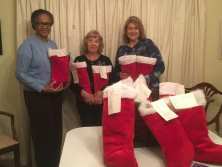 Sending Christmas stockings to our soldiers through Boatsies Boxes has been a NJ State Federation of Women's Club initiative for many years. (The Franklin Woman's Club is part of the NJ State Federation of Women's Clubs). In 2016 all participating NJ Women's Clubs collected and sent 1,280 stockings along with over $7,000! Since 2008, when NJ Women's Clubs began donating to Boatsie's Boxes, over 10,000 stockings and over $20,000 have been donated. The Franklin Woman’s Club has embarked on an initiative to help prevent child abuse in NJ as part of a state-wide project spearheaded by the New Jersey State Federation of Women’s Clubs (NJSFWC) under which the local club operates: The Click for Babies Campaign. Franklin Woman’s Club members are knitting or crocheting purple newborn and preemie caps to support the Period of PURPLE Crying® program described below. These caps will be donated to Prevention of Child Abuse – NJ who will distribute them to babies at participating PURPLE hospitals throughout New Jersey as a visual reminder of the importance to keep babies safe. In 2017, several organizations' needlework clubs partnered with the Franklin Woman's Club to increase the number of hats made and/or to donate funds toward the initiative: (i.e., Senior Wellness Center at Bridgewater, Quail Brook and Montgomery Senior Centers, the Scary Mommy organization). Together with these organizations, the Franklin Woman's Club donated 178 purple hats. An additional partner was identified at year's end (Somerville Senior Housing) whose hats will be donated in 2018. The Period of PURPLE Crying® program, developed by the National Center on Shaken Baby Syndrome (NCSBS), draws attention and educates parents and caregivers about Shaken Baby Syndrome/Abusive Head Trauma (SBS/AHT). In this form of abuse, when an infant or young child is shaken violently, the head is impacted, leading to severe injuries and even death. A key component of the campaign is to educate people on this normal developmental phase that is temporary. Become a partner with the Franklin Woman’s Club by knitting or crocheting a purple baby cap. For guidelines and patterns for knitted/crocheted baby caps, visit: http//:clickforbabies.org/stitchers-club. Make a donation for the purchase of yarn. 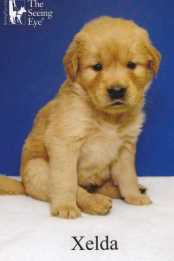 Please make check payable to the Franklin Woman’s Club, indicating “Click for Babies Campaign” in the subject line of your check and mail to: Franklin Woman's Club, P O Box 5793, Somerset, NJ 08875. Donate newly purchased skeins of (soft-to-the-touch) yarn in any shade of purple to the Franklin Woman’s Club. Call (732) 844-9002 and leave a message requesting that your donation of yarn or hats be picked up. A FWC member will contact you to make these arrangements. This year, 1.7 million children will die from diseases that have all but disappeared in the U.S. Why? Because one in five children around the world does not have access to the life-saving immunizations needed to survive. What's the solution? It’s simple; vaccines save lives. Millions of children could be spared from measles, pneumonia, diarrhea, polio and other preventable diseases if we could simply get them the vaccines they need. When a child begins life with the protection of vaccines, the door is opened to more developmental firsts — first steps, first words, a first day of school. Immunized children are more likely to celebrate their fifth birthday, do well in school and go on to be productive, healthy adults. Expanding access to vaccines strengthens our ability to fight disease globally and keep our families healthy here at home, while improving economic stability around the world. The UN Foundation's Shot@Life campaign educates, connects and empowers Americans to champion vaccines as one of the most cost-effective ways to save the lives of children in developing countries. A national call to action for this global cause, the campaign rallies the American public, members of Congress, and civil society partners around the fact that together, we can save a child’s life every 20 seconds by expanding access to vaccines. By encouraging Americans to learn about, advocate for, and donate vaccines, the United Nations Foundation's Shot@Life campaign will decrease vaccine-preventable childhood deaths and give children a shot at a healthy life. In honor of Earth Day, 2017, the Franklin Woman’s Club donated a Firefall Maple tree to Franklin High School on Thursday, April 12. 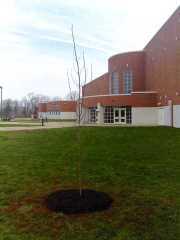 The tree was planted in the back of the school near the events lobby entrance. In the future, the club plans to add a memorial plaque dedicated to previous club members. The tree was purchased from the Township’s Shade Tree Commission and Nancy Gale, Franklin Woman’s Club Conservation and Garden Chairperson, coordinated installation details with Jean Lewis, Franklin Township Board of Education (Buildings & Grounds Dept.) along with cooperation from FHS Principal Cheryl Clark’s office. The FWC also wishes to acknowledge John Schunk and the Board of Education Buildings & Grounds Department staff who planted the tree. his special Franklin Woman’s Club initiative is in keeping with the community service mission of the club and their dedication to environmental conservation activities. Franklin Woman's Club members donated and assembled large, festively wrapped food baskets which were delivered to the Dept. of Community Resources before Thanksgiving and Christmas/Hanukkah. Thanks to club members' generosity, a total of six baskets were given to local families in need. 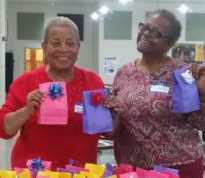 Members of the Franklin Woman's Club donated and assembled a total of 750 candy favors for area nursing homes to help residents celebrate Halloween, Thanksgiving, Christmas/Hanukkah, Valentine's Day, St. Patrick's Day and Easter. Thanks to everyone who participated in this special project! We filled 6 stockings for BOATSIE’S BOXES. These packages shipped out overseas to the troops before Christmas. Clubs members donated food for Thanksgiving baskets. Three families were selected to receive these baskets. 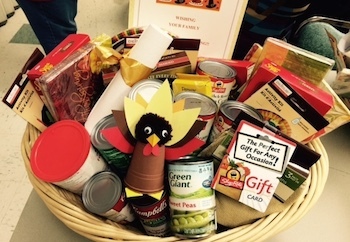 Each basket was filled with can and boxed food items in addition to a ShopRite gift card. Halloween Candy Favors have been assembled and delivered to 100 recipients at the Franklin Care Center.